Lia Milthorpe has always had a quiet, predictable, and happy life. But when her father dies unexpectedly, leaving her, her twin sister Alice, and her younger brother Henry orphans, strange things begin to occur. A peculiar mark appears on Lia’s wrist, and Alice begins acting secretive. Lia's dreams become scarily real and threatening. It's not long before she discovers that she and Alice are a part of a dark prophecy that will firmly plant each sister on opposing sides and challenge every bit of loyalty, strength, and courage that Lia possesses in order to bring an end to the prophecy—before her sister can wreak havoc on the world. From the very beginning of Prophecy of the Sisters, Lia is a convincing character; her hesitance to bring the strange circumstances that affect her to light and her motivations are true. Michelle Zink writes with startling clarity and vivid descriptions that establish a dark, mysterious, and brooding air that rivals that of the classics Rebecca and Jane Eyre. Her keen eye for detail and talent for revealing multitudes of aspects of the book without seeming didactic builds steady suspense throughout the entirety of the novel. Lia's relationship with Alice is very fascinating, especially since many readers of the Young Adult genre are so accustomed to twin characters who are extremely close (as in Jacquelyn Mitchard's The Midnight Twins or Marissa Doyle's The Bewitching Season). It is complex and intriguing relationship, made even more so by the fact that Lia openly admits that she and Alice aren't especially close, but still she struggles with the idea that Alice may be evil and intent on doing her harm. It is the idea of one of nature's closest entities—twins—pitted against each other that really draw the readers in. Another interesting aspect of Prophecy of the Sisters is Lia's romance with James, which is a real nice touch that adds a little light-heartedness to the story. At the same time, it would have been nice to know a little more about the beginning of their courtship, and it does seem that once Lia decides that if James knows the truth about her, he'll be in unnecessary danger, he does stay out of the picture, only to pop up once again towards the end. It will be interesting to discover his role in future books. All in all, Zink has created an intense and riveting work brimming with myths, knowledge, and plenty of chills. Her characters are charming and strong, her otherworldly realms dangerous and eerie, and her plot entirely engrossing. Prophecy of the Sisters is overwhelmingly enthralling and engaging, with much of the same appeal as Libba Bray's A Great and Terrible Beauty. Readers shall rejoice at the debut of a stellar new voice with a very persuasive and unique point of view. Cover Comments: I love this cover. I love the colors, and the statues and the eerie air that they exude--it sets the mood for the book perfectly. I think that this is the perfect cover for this book. Speaking of setting the mood of the book, check out Michelle's son's MySpace, where you can find the Prophecy fo the Sisters score! It's really quite excellent! 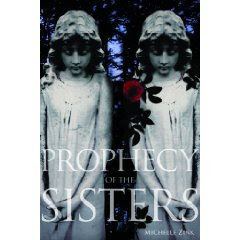 Prophecy of the Sisters comes out in August! It's on order! Can't wait. This book sounds great! I really want to read it. is it set in the Victorian era? It sounds like it is. i'm very excited to read this book, too! thanks for the review and hurrah for a fellow 09 deb! I really can't wait to read this one! Looking forward! The twins in The Book of Nonsense are also not close. But they are boy/girl twins. Am reading this now. Love it so far. I promise you more romance in book two! I love the cover, too, and I also plan on getting it soon. Great review. I can't wait to read Michelle's book! I am waiting for an ARC. The cover is insane. Isn't it fantastic? LB always does a really great job with covers! I've been seeing Michelle's name around alot recently. It looks like a fabulous book. I enjoy stories about twins. Your review has made me put another book on my 'to buy' list! Just when I thought I'd finally got them all!